A Bird Hunter's Thoughts: On the way to Idaho! My wife and I are on the way to a field trial in Idaho. I had so much fun hunting out there in January that I was looking through the NSTRA calendar and noticed they are in the middle of their season! Whoa, Nellie! I entered and they had some room left for one dog. I'm taking Cap with me. Although he's the youngest, he needs the traveling experience and I want him to be comfortable at trials other than the same old fields around there. 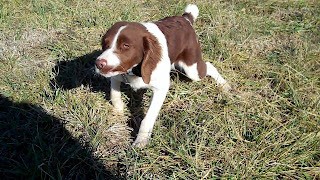 He's a powerful little bird dog, too. It's been over a month since he's smelled a bird, but that's what the first run will be for, I guess. I'm hoping he'll do OK and maybe score pretty good. He's easy to turn and listens well. This will be more fun for me, because I get to bring BJ with me and we'll drive around and see the country for a full day before we show up in Asotin, WA for the trial on Friday. I hope to see Hell's Canyon and that area and maybe look at some good quail and chukar habitat.